In order to celebrate a few 30th birthdays the other week including TT#1 a big group of us went to Frontier with the mission of tackling their whole wild boar. I wasn’t quite sure what I was excepting from the whole experience but I was really looking forward to it! Our group was placed right by the front window of the restaurant and so the first thing you saw when you walked in was a team of chefs breaking down this whole wild boar. We were very much the center of attention, and I thought that placing us in front is a great way of getting the rest of the patron’s attention and promoting their whole animal services. Besides wild boar, Frontier also does full-grown pig, suckling pig, alligators, lambs, and goats. Although, pig is usually the most popular. According to Chef Jupiter at Frontier, the wild boar is rubbed with brown sugar, garlic and other spices 24 hours before it’s cooked. 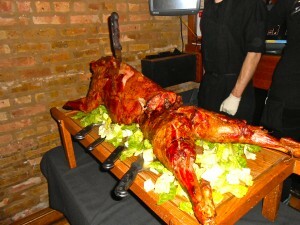 They smoke the boars for six to eight hours using apple and cherry woods. If you’re wondering where the boars actually come from, they are wild caught right out of Texas. One of the craziest things about the wild boar was how the chefs just tore right into the tenderloin and pulled it right off the bone, sliced it up, and passed it around. We also had the chance to try the shoulder, belly, ribs, and legs. I was not a huge fan of the belly or ribs as they were more the fatty part of the animal, and they don’t quite taste like a pig. Boar meat is darker, leaner, sweeter, and has a touch of game flavor. Overall, I really enjoyed the whole experience and thought it was a perfect meal/activity for a bunch of the guy's birthdays. It's definitely not for the faint of heart or vegetarians, but the sides that came along with the animal made it enjoyable for everyone in attendance. I had a chance to try Frontier's great succotash, mac 'n cheese, johnny-cakes, and all the bbq sauce you could want. I’ve included some quick recipes below on how TT#1 and I enjoyed the leftovers. All the recipes are totally quick and easy and semi-homemade, and since the boar has already been cooked they are all perfect for weeknight meals!